WILMINGTON, Del., April 17, 2019 /PRNewswire/ -- DowDuPont (NYSE: DWDP) today announced three additional members to the future board of directors of DuPont, currently the Specialty Products Division of DowDuPont. 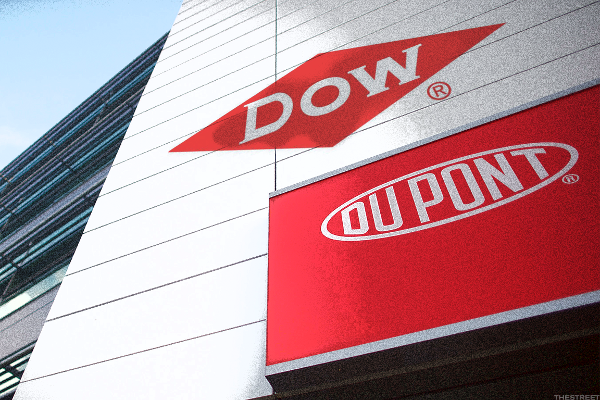 We received shares of Dow Inc. on its spinoff from DowDuPont last week. Dow Inc. slides after JPMorgan initiates coverage with an underweight rating. Following the April 2nd spinoff of Dow, DowDuPont announced a reverse stock split. ActionAlertsPLUS Research Analyst Zev Fima explains what that means both institutional and retail investors. We look at DowDuPont, CVS Health and Disney. UBS is bullish on DowDuPont. What Does the DowDuPont Spinoff Mean for Investors? On April 2nd, 2019 Dow Inc. spun off of DowDuPont and replaced it in the Dow Jones Industrial Average. ActionAlertsPLUS Senior Portfolio Analyst Jeff Marks explains what it means for investors. The decided lack of enthusiasm for Lyft is really good for this market, says Jim Cramer. It shows investors are behaving rationally. Jim Cramer weighs in on Mastercard, Carrizo Oil & Gas, Duluth Holdings, Alnylam Pharmaceuticals, United States Steel. Dow CEO Jim Fitterling and his company will do its best to not be a bad actor in the vast scheme of things. The market appears to agree that this event was a value-unlocking catalyst. Dow shares debuted on the New York Stocks Exchange Tuesday, while being added to the Dow Jones Industrial Average, after the group was formally spun-off from parent DowDuPont Inc. DWDP last night. Dow Inc.'s first official day of trading will be today, April 2nd.